PROF. FRANCIS LANDY: Can a Husband Annul His Wife’s Nazirite Vow? (TheTorah.com). Numbers 6 allows women to take the nazirite vow, rendering them “holy to YHWH” with a temporary, quasi-priestly status. Numbers 30, however, grants fathers and husbands veto power over vows made by women under their auspices, but without mentioning the nazirite vow. How are we to understand the relationship between these two chapters? STILL NEGOTIATING: State Department working to keep Iraqi Jewish Archive in US. US State Department says working to renegotiate return of ancient Jewish documents to Iraq as Senators work to keep trove in US (JTA via Arutz Sheva). The State Department says it is working with Iraq to extend the stay of a trove of Jewish artifacts from the country, while a bipartisan group of senators introduced a resolution recommending that the items not be returned as planned in September. “We continue to work with the Government of Iraq and relevant stakeholder[s] to extend the exhibition in the U.S.,” a State Department official told JTA in an email on Thursday. Background here, with many links going back to the recovery of the archive in 2003. Several years ago, I gave my own thoughts on how the situation should be handled here. I stand by what I said there. I would only add that feedback from the American public has made it clear that they are opposed to the return of the archive to Iraq. The State Department seems to have taken that on board. And I don't see that it is in Iraq's interest to have a falling out with the U.S.A. over this comparatively small issue. I hope that the agreement to return the archive to Iraq can be renegotiated to the satisfaction of both sides. H-JUDAIC: CFP: Sacred Troubling Topics in Hebrew Bible, New Testament, and Qur’an. Abrahamic sacred texts continue to inspire a diversity of scholarship that seeks to transform the ancient into the contemporary, the remote into the immediate, and the distant into the visceral experience. This seminar of three panels takes that process into the examination of troubling topics, often overlooked, yet found in the Tanakh, New Testament, and Qur’an. Building from foundational texts, other sacred works such as Talmud, Apocrypha, Patristics, and Hadith as well as philosophy, textual satire, and the arts may be brought into play. This is for the American Comparative Literature Association's annual meeting in March of 2019. The call-for-papers period is August 30-September 20, 2018. Follow the link for further particulars. THIS WEEK'S PARSHA (TORAH READING): They Might Be Giants – Parshat Devarim (Rabbi David Kasher, Boulder Jewish News). These are the technical attempts to prove Og’s gigantic stature. But much more interesting are the many strange stories of Og the Giant recorded in the Talmud and Midrash. Taken together, they constitute one of the most fascinating legends in rabbinic literature. Og is a shadowy figure who seems to always have been around, and – according to the rabbis – keeps popping up at key moments in the Torah’s narrative. This essay is a nice collection of rabbinic traditions about Og. His story is complicated by the fact that the ancient noncanonical work the Book of Giants features a giant character named Ohyah. Later on, traditions about him were mixed into the Og tradition. Hence the placing of Og at the time of the Flood and his connection with the angelic watcher Shemichazai (Shemihazah). The latter is another character in the Book of Giants. The many past PaleoJudaica posts on Og the giant are collected here. And if you didn't get the allusion in "They Might Be Giants," this might help. ANCIENT JEW REVIEW: Book Note | At the Temple Gates: The Religion of Freelance Experts in the Roman Empire (Brigidda Bell). Wendt, Heidi. At the Temple Gates: The Religion of Freelance Experts in the Roman Empire. Oxford University Press: New York, 2016. Including ancient Jewish freelancers, among them the Apostle Paul. MATERIAL CULTURE: As part of a book-writing project, Dr. Brent Nongbri has been crafting reconstructions of some of the Coptic Gnostic Codices from Nag Hammadi. This project is not about the texts in the codices, but rather it seeks a better understanding of the physical structure of the objects. This is a brilliant way to extract more information about antiquity through the study of ancient artifacts. The more we know about ancient book production, the better we can put the surviving ancient books in a material and social cultural context. And the better we will understand those ancient books. THE CSTT BLOG: WELCOME TO HELSINKI! A LIST OF CSTT CONTRIBUTIONS TO THE EABS/ISBL MEETING (RICK BONNIE). The essays in Reading the Gospel of John’s Christology as Jewish Messianism: Royal, Prophetic, and Divine Messiahs seek to interpret John’s Jesus as part of Second Temple Jewish messianic expectations. The Fourth Gospel is rarely considered part of the world of early Judaism. While many have noted John’s Jewishness, most have not understood John’s Messiah as a Jewish messiah. This is the conference volume for the 2016 "John the Jew" Enoch Seminar, on which more here and links. I attended the Seminar but did not present a paper. PHOTO ESSAY: What it's like visiting one of the world's greatest treasures, the 2,000 year-old mountaintop fortress Masada (Ben Gilbert, Business Insider). Visiting Masada, the ancient fortress built atop a mountain plateau in modern day Israel, is a life-changing experience. No caveats necessary. There's simply nothing like visiting an ancient mountaintop fortress that overlooks the Dead Sea. It doesn't feel real. But because of its isolation and the arid desert climate, the fortress once occupied by King Herod is a remarkably well-preserved relic of humanity's ancient past, one you can climb to on the same paths used by visiting dignitaries and invading Roman troops. Many years ago I too climbed the Snake Path in July. It was an insane thing to do. I recommend you try it in a cooler month. VARIANT READINGS: The Moschos Ioudaios Inscription (Brent Nongbri). People in antiquity are much like people in the present. They stubbornly refuse to do what we expect them to do. Moshe Halbertal, Stephen Holmes. The Beginning of Politics: Power in the Biblical Book of Samuel. Princeton: Princeton University Press, 2017. 232 pp. $27.95 (cloth), ISBN 978-0-691-17462-4. There is a long tradition of claiming that politics and political theory in the West belong to Athens, rather than to Jerusalem, and another tradition just as long of rebutting this claim. Moshe Halbertal and Stephen Holmes join the latter tradition with their new work, The Beginning of Politics: Power in the Biblical Book of Samuel. The book will sit nicely on the shelf next to Eric Nelson’s The Hebrew Republic (2010) and Michael Walzer’s In God’s Shadow (2012). The former argues for the centrality of the Hebrew Bible in general and Samuel/Kings in particular to seventeenth-century European political theory, and the latter asserts that the absolute dominance of God in the life of ancient Israel left no room for the development of an autonomous human political sphere. Halbertal and Holmes have set themselves the task of rejecting the latter claim, and judging by Walzer’s blurb (“a wonderful discovery”), they appear to have convinced him. SOURCE CRITICISM: Gad and Reuben Receive Land in the Transjordan: A Documentary Approach (Dr. Liane Feldman, TheTorah.com). The tribes of Reuben and Gad ask Moses for permission to settle in the Transjordan (Num 32). A look at this lengthy narrative, what exactly they request and what Moses answers, uncovers several contradictions and inconsistencies. Separating the contradictory elements in the story allows for the identification of two parallel accounts. Could be. It's been a while since I've heard much talk about the Elohistic source. But I don't make a big effort to keep up with Pentateuchal source criticism these days. ARCHITECTURE AND ARTIFACTS: ARCHAEOLOGISTS UNCOVER GATE TO BIBLICAL CITY OF ZER (TAMARA ZIEVE, Jerusalem Post). The Iron Age II gate was excavated on the site of et-Tell, which is one contender for being the city of Bethsaida in the New Testament era. The other contender is the site of el-Araj. Background on the two sites and the debate is here (cf. here) and links. I don't know how secure the identification of et-Tell with Zer is. Another finding made in the past two weeks was discovered underneath what was seemingly the floor of a Roman temple built by Herod’s son Philip, which he dedicated to Julia, the daughter of Augustus. There archaeologists found coins, beads, jugs and house keys as well as a shield that belonged to a Roman soldier. The most significant finding was a coin dated to 35 BCE, which was minted in Acre on the occasion of the arrival of Cleopatra and Marc Antony. There is a total of 12 of these coins. See the article for photos of the house key and the coin. THIS WEEK'S DAF YOMI COLUMN BY ADAM KIRSCH IN TABLET: Cooking Times and Air Rights. In this week’s ‘Daf Yomi,’ Talmudic rabbis determine the finer points of animal sacrifice and follow their logical reasoning to the limits of the absurd. Tractate Zevachim is all about the recognition that, when human beings come together to slaughter animals, things will sometimes go wrong: An animal will wander into the wrong area of the Temple, or the blood will spill on a priest’s robe, or a burning limb will fall off the pyre. A realistic Judaism has to make provisions for what to do when the physical world fails to obey the strict laws of the spiritual world. Rather than see such ruptures as defeats—evidence that the physical can never achieve the perfection of the spiritual—the rabbis see them as opportunities. By extending the safety net of the law to cover moments of error and lapse, the Talmud brings them back within the orbit of the divine. BIBLE HISTORY DAILY: Giant of New Testament Archaeology. James F. Strange (1938–2018) (Daniel A. Warner, Donald D. Binder, Eric M. Meyers, and James Riley Strange). Jim developed a range of archaeological skills that few possess. His work with his father taught him surveying with an optical transit. He drew balks, top plans, pottery, glass, and artifacts with precision. He wrote excavation manuals for Caesarea and Meiron and published articles on archaeological method and theory. Early on, he established himself as a ceramicist, and his work in the MEP allowed him to contribute to the typology of Hellenistic- through Byzantine-period pottery widely in use in Israel today. Jim was a polyglot, speaking four languages and reading 12 in addition to English. His desire to disseminate his research resulted in an impressive body of published works. I didn't think it was possible for me to feel more confused about the chronology of the Gospel Passion narratives. But after reading this I am. Some past posts on that question are here, here, here, here, and here. 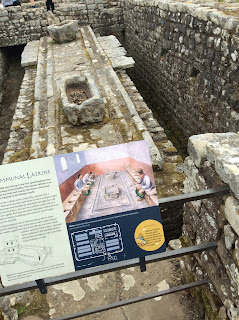 MY TRIP TO HADRIAN'S WALL AND ITS ROMAN SITES began with Vindolanda, just as my 2006 trip did. 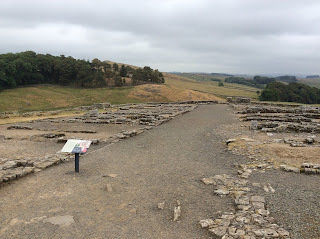 This is a current photo of the site of Vindolanda. 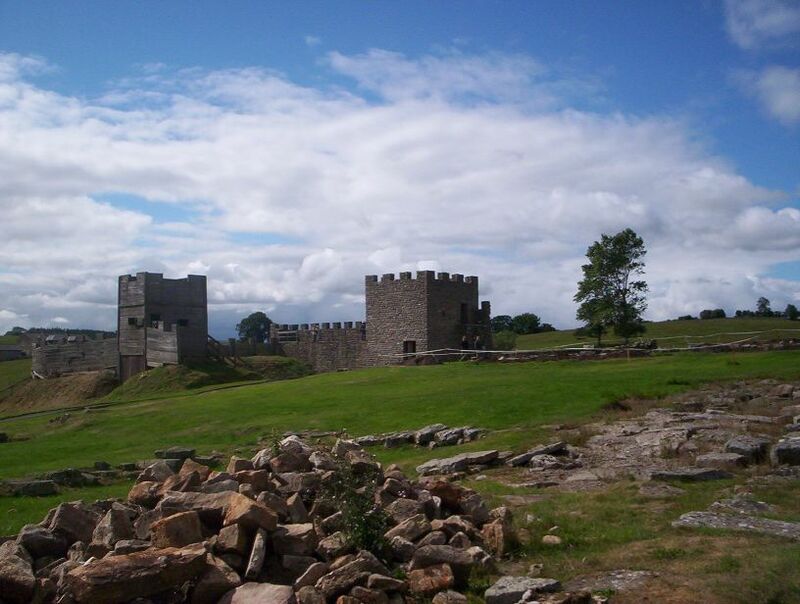 If you compare this photo from 2006, you will see that the wooden replica tower on the left has been rebuilt. You can click on this and all the other images to see a larger version. 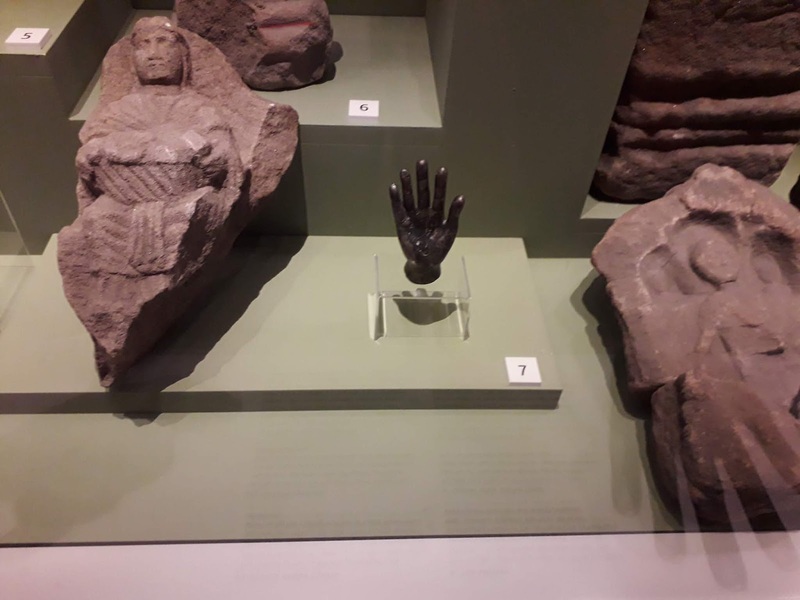 That newly-excavated bronze Hand of Jupiter was on display in the Museum. It was tiny, just a few inches across. I won't go into detail about Vindolanda here. For a report on my visit there in 2006, see here. Other posts involving Vindolanda, its archaeology, and the extraordinarily important archive of documentary texts excavated there, are here and links, and here, here (on a similar find in London), here, and here. 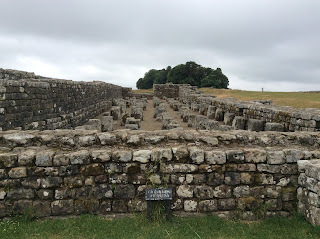 In some of those posts I also discuss some indirect points of contact between the Vindolanda and London texts and the Judean Desert Scrolls etc. I should also mention the Minimus the Mouse books, for any parents who are looking for an entertaining way to introduce their children to Latin. The books are set in Vindolanda and are based on the epigraphic discoveries there. I went through them with my son when he was a wee lad. I recommend them highly. 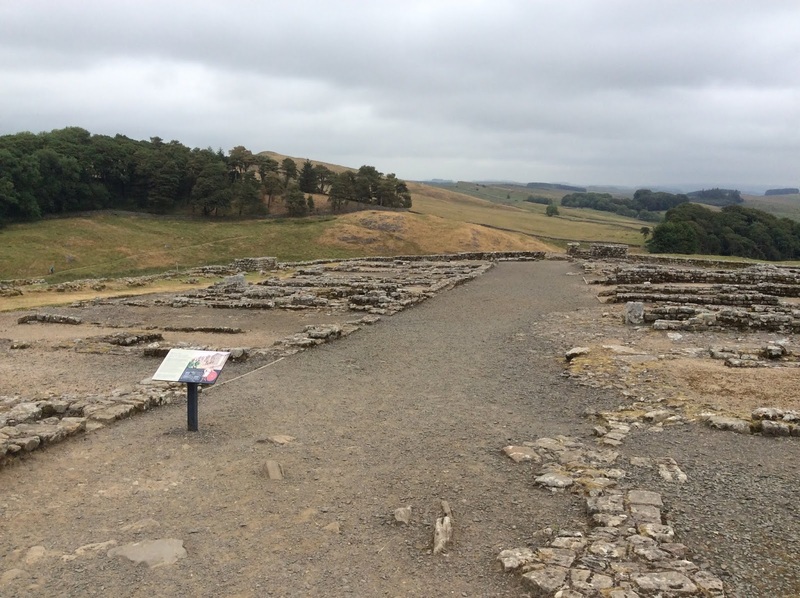 On the same day as the current Vindolanda visit, we went to the Roman Army Museum. It is also managed by the Vindolanda Trust. It is situated beside the site of the Carvoran Roman Fort. I don't have any photos of the fort area. The fort pre-dates the Wall and is not directly associated with it. There's not much left visible to the eye, although it has never been properly excavated. 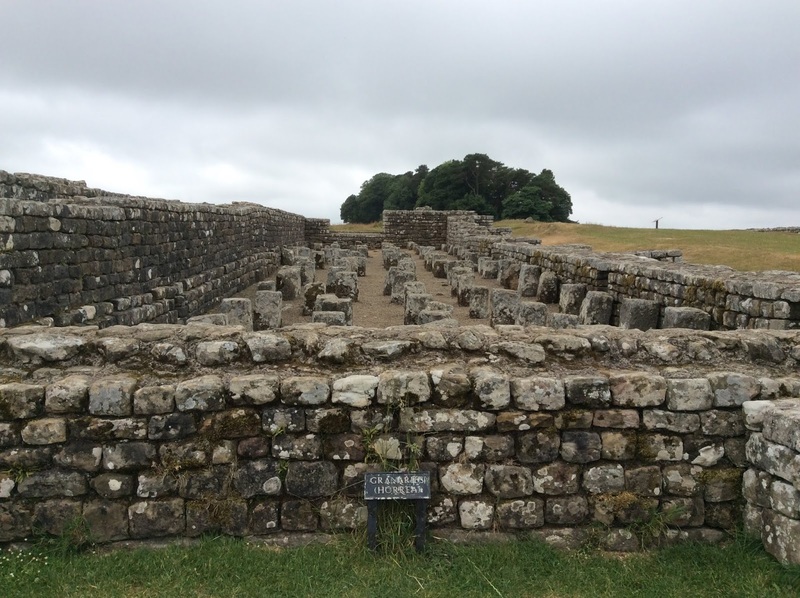 Finally, the next day we visited the Housesteads Roman Fort, which is built directly on the Wall. It is one of fifteen forts built along with the Wall to monitor it. I posted a photo of the fort and Hadrian's Wall here. Here is another of the fort. As you can see, the site has been excavated and conserved. This is the barracks for the soldiers. This is a photo of the granaries. A comparably old toilet was excavated near Qumran. Posts on it are collected here. An even older one was excavated at Lachish. And there's more on ancient toilets here. There is also a nice museum for the Housesteads site. I have no expertise in Roman Britain, so this more a question than an observation or suggestion. 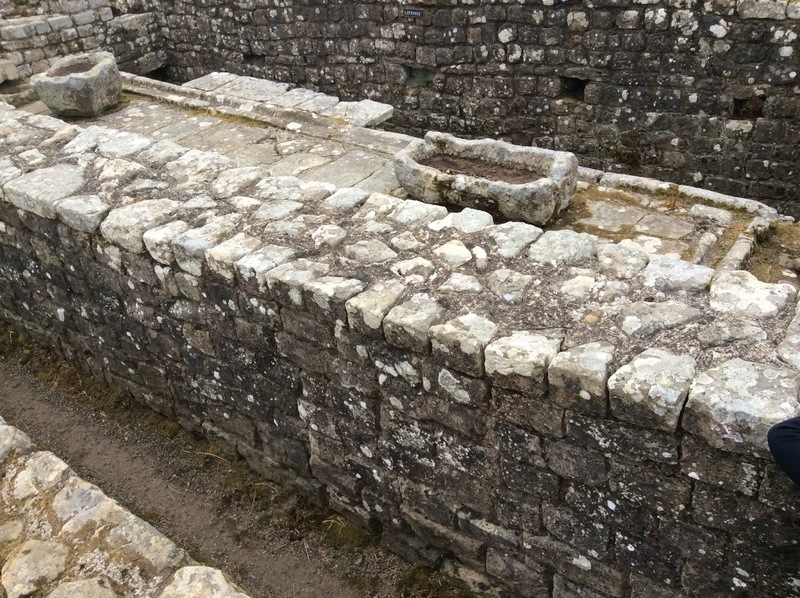 Are the Carvoran and Housesteads Forts situated in areas where anaerobically-sealed layers of soil are likely to have preserved discarded writings like those at Vindolanda? If so, they could be sitting on archives as significant for ancient British and Roman history as the Dead Sea Scrolls are for Israel. Perhaps someone should organize expeditions to have a look. I know there's no money for that now, but some publicity could probably raise some. Just a thought for you specialists in Roman Britain. That was this year's trip to Roman sites around Hadrian's Wall. I love the area and I imagine I'll be back. The rest of the holiday was at the Lake District and no ancient ruins were involved. 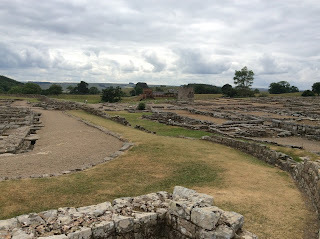 While we're on the subject of ancient Roman sites in Britain, see also my past post on Roman Chester. YHWH'S FAST-FOOD RECIPES? Which Sacrificial Offerings Require Libations? (Dr. Naphtali Meshel, TheTorah.com). A burnt offering (olah), described as “sweet smelling” food for YHWH, always includes grain and wine libation “side-dishes,” constituting a complete meal. A purification offering (chattat), however, is a cleansing ritual. Should it also have an accompanying libation? The Masoretic Text of Numbers 28-29 offers an inconsistent answer that differs from that of the Septuagint and Samaritan Pentateuch. A burger with fries and a soda is common—hence the typical adage, “Do you want fries with that?” A combination of only fries and a soda, however, is not licit: that is, while it is not illegal to order fries and a drink separately, they do not constitute a meal. This is reflected in the absence of such an option from most “combo” menus. That's from an American perspective. 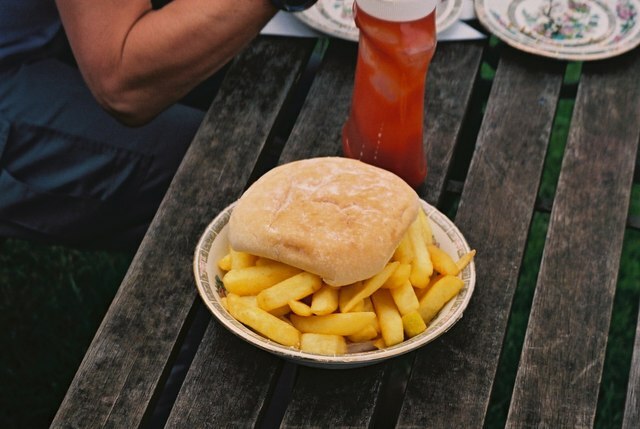 In Britain, a fast-food meal consisting of starch and a drink is not uncommon. The first time an American sees someone here order a chip butty, it is mind blowing. What constitutes a meal, for God or anyone else, is very much culturally conditioned. The effort of rationalizing biblical time-maps into the semblance of a critical modern history, as was the custom until late in the twentieth century, has thus been abandoned by all but a few scholars. Instead, we are obliged to see biblical narratives of the past as testimonies to the ways in which the creators of those texts imagined worlds and stories where their Israel and its deity played out their identities and their destinies—and would continue to do so. Chapter from: History, Politics and the Bible from the Iron Age to the Media Age (T&T Clark, 2018). For more on the work and career of the late Philip R. Davies, see here and links. BIBLE HISTORY DAILY: Giant of the Persian Period. Ephraim Stern (1934–2018) (Hillel Geva). Professor Ephraim Stern was one of Israel’s foremost archaeologists, a pioneer in his field with numerous achievements to his credit and an international reputation as a scholar. Alongside his academic pursuits, he devoted considerable effort to promoting public interest in archaeological excavations and research. NUMISMATICS: NGC Ancients: Classic Greek Coins, Part 5 (CoinWeek). With nice images and descriptions of coins from ancient Carthage, Persia, Phoenicia, and Judea, as well as other place of less direct interest for the study of ancient Judaism. WHY INDEED? Why is Everyone Obsessed With the Book of Enoch? The uniqueness and mystery of this ancient text have captivated millions (Stephanie Hertzenberg, Beliefnet). As interest in Enoch grew, the book began to appear in various media outlets. The History Channel referenced it repeatedly in various shows. Blogs and websites that dealt with everything from scholarly articles about ancient texts to attempts to predict the end of the world began to reference Enoch. Interest grew, and more people began to look for information on Enoch. This led to more people putting out information on Enoch. A feedback loop formed, and it has not collapsed yet. This article isn't exactly a comprehensive account of 1 Enoch. But it does flag the increasing popular interest in the book and things in it which appeal to a popular audience. Psalm of Solomon 2 is a lament for Jerusalem after Pompey captured the city in 63 B.C. Although his name is not specifically mentioned, the author of the psalm clearly has Pompey in mind. He is called an “arrogant sinner” who brought battering rams against the walls of the Temple (2:1). According to Josephus, the city surrendered to the Romans but the Temple itself was captured. Pompey therefore brought “mechanical engines, and battering-rams from Tyre” (Antiq. 14.4.2). This psalm reflects a “two ways” ethic found in Second Temple wisdom literature. Building on the covenant renewal in Deuteronomy 30:11-20, there are only two ways the people can go, either toward life or toward death. If Israel follows the Law, they will be blessed and have peace and material prosperity. However, if they do not follow the Law, they will be cursed and not experience peace and prosperity. Psalm 1 contrasts two kinds of people, the righteous person and the sinner. The righteous is like a tree planted beside water (prosperous and bearing fruit), but the sinner is like a bush growing in the desert, barely surviving and never bearing fruit. Psalm of Solomon 4 is labeled a dialogue (Διαλογὴ) although not in the sense of a conversation between Solomon and the hypocrite. The Psalm stands in the “two ways” tradition. It begins with a stunning condemnation of those who sit in the council but are “far from the Lord” and ends with a blessing on “those who fear the Lord in their innocence” (4:23). There is nothing in Psalms of Solomon 5 to hint at a date or historical circumstance. The psalm begins with praise to God for his gracious provision during a time of affliction (v. 5). Several times the author describes himself as hungry (v. 8, 10, 11) or in need of kindness (v. 13), but there is no specific historical situation in mind. Most Jews living in the Diaspora would hear their own experience in this Psalm. This psalm is a description of the invasion of Jerusalem by Pompey. The invading army is foreshadowed by “the blast of the trumpet sounding slaughter and destruction.” Since the sound of destruction is in the holy city of Jerusalem, the writer is crushed by what he heard and becomes physically ill (8:5). The writer sees himself as one of the innocent (8:23) who are devout (8:34). Tübingen, Germany: Mohr Siebeck , August 2017. 238 pages. The study of Jewish apocalypticism and mysticism has been enriched in recent years by a revival of the study of the Slavonic pseudepigrapha. Andrei Orlov has been at the forefront of that discussion. His study of The Enoch-Metatron Tradition (TSAJ 107; Tübingen: Mohr Siebeck, 2005) has rightly been hailed as a major contribution. Orlov has now followed this with a study comparing the figure of Yahoel in the Apocalypse of Abrahamand Metatron in Sefer Hekalot (3 Enoch), arguing for continuity between the apocalypses and later mystical traditions. The review is by Professor John J. Collins. I noted the publication of the book here last year.